Just like they did back in 2009, the Yankees enter the postseason with the best record in the American League. But beyond CC Sabathia — and especially beyond Sabathia and Ivan Nova — the Yankees have plenty of question marks about their starting pitching. Here now, three questions Girardi needs to answer before Friday. 1. Could the Yankees use a three-man rotation in the ALDS? The Yankees have plenty of starting pitchers to choose from, but they don't necessarily have many reliable starting pitchers to choose from — which will make it all the more tempting to lean on CC Sabathia as much as possible during the playoffs. Joe Girardi, who has yet to reveal much about his postseason pitching plans, said the other day that the Yankees would at least consider a three-man rotation, noting that only the pitcher who starts Game One would need to pitch on short rest. The Yankees used a three-man rotation during the entire 2009 playoffs, of course, but the schedule that year made it easier to do so. That year, they used the three-man rotation more or less out of necessity, but this year is a little different: They have arms available to start, but Girardi will have to decide whether he thinks the Yankees need to postpone using a fourth starter as long as possible. For what it's worth, the Yankees haven't needed a fourth starter in the ALDS under Girardi since they swept Minnesota in the first round in both 2009 and 2010. Which means that in each of the last two years, Girardi's had the luxury of starting CC Sabathia in Game One of the ALCS on sufficient rest. But unless they swept their first-round opponent this year, with a three-man rotation Sabathia would either have to pitch Game One of the ALCS on short rest, or get pushed back to Game Two. 2. Did Freddy Garcia earn a playoff start with his win Saturday? Freddy Garcia had posted a respectable 3.09 ERA through August, but his first three starts in September were concerning: He allowed fifteen earned runs in just twelve and a third innings of work, and over those three starts, he allowed 21 hits, including six home runs. 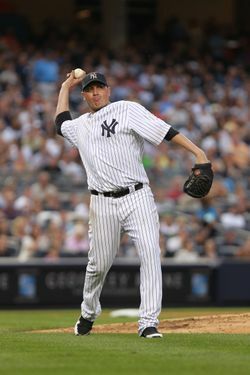 Against Boston on Saturday, though, Garcia threw six innings of scoreless ball, and afterwards, Girardi praised the righty, saying that he used all his pitches effectively. But perhaps more importantly, Girardi also said that he likes the fact that Garcia, who doesn't rely on his velocity to get hitters out, gives opponents something of a different look, compared to the Yankees' other potential starters. And considering that the other candidates for the final two spots in a potential four-man rotation have hardly made a strong case for inclusion this month, that "different look" could give Garcia an advantage when the rotation is set. 3. Is Bartolo Colon finished? If, for argument's sake, Sabathia, Nova, and Garcia are part of a four-man rotation, the final spot will come down to Colon and A.J. Burnett, now that Girardi has announced that Phil Hughes will work out of the bullpen. Burnett's struggles have been well documented: He's got good stuff, but he implodes too often, and his ERA has risen steadily all season. (Since the All-Star break, he's 3-4 with a 6.88 ERA and a WHIP of about 1.75.) Still, like Garcia, Burnett's last outing was a good one. But perhaps more significantly, not only has Bartolo Colon become less and less effective, his velocity has dropped off. When the Yankees signed Colon, they didn't know how many innings they would be able to get out of him, and there's no doubt he exceeded their preseason expectations. But save for a strong outing in Anaheim on September 9, he's struggled in the season's final weeks, and there's good reason to think that Colon's given the Yankees as much as he's going to give them as a starter. And so perhaps the best thing Burnett has going for him right now is the process of elimination.